I am still chockablock with work, and have only a few minutes to get my words down while on the bus. But I did take a break to do a couple of nice things in the last week. Last Thursday I went to a lovely free book reading for the launch of local author Judith Allnat's new book The Moon Field. We learned about how family stories had inspired this tale of two working class lads who ended up volunteering to fight in the First World War. It is set against the picturesque and tranquil surroundings of Keswick, contrasted with the horror and destruction of Flanders. Can't wait to read it. There was wine and nibbles too. 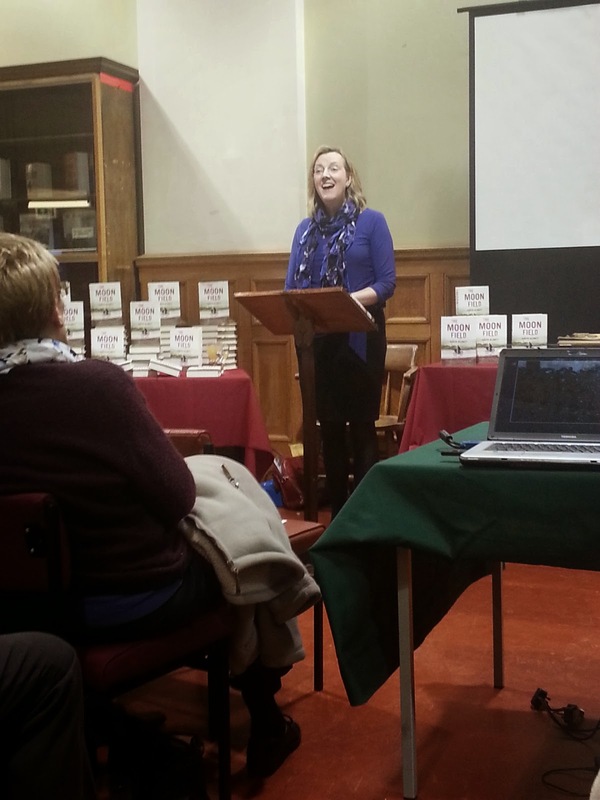 Why not subscribe to your local library blog to see what interesting things they are putting on? However, on Friday I went to a New Year party at my friend Zoe's house. Her boyfriend is Mexican but lives in China so it seemed appropriate to celebrate... with a science fiction theme??? Yes. So OH and I dressed as rough interpretations of the Tom Baker Doctor Who and Bennie Summerfield (using our actual clothes) and joined Fliss, a couple of Neos, stormtroopers, dragons, Alien, Predator, a Dalek, Arthur Dent a character from City of Bones, Poison Ivy and Jon Pertwee. 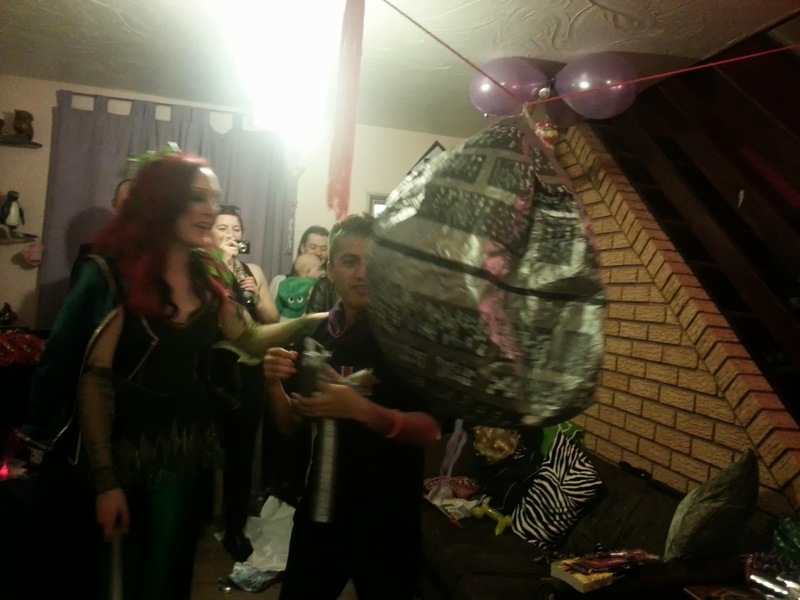 We played pass the parcel and Death Star piñata. They made that. Isn't it brilliant! Other bloggers have mentioned stuff that's not terribly helpful for those looking for the frugal way. I cite the BBC's Food and Drink. Their 'budget' show had a great piece by Arabella Weir on how families might well choose biscuits over apples if down to their last 30p, but lovely Tom Kerridge and lovely Michel Roux junior were just a tad out of touch. Tom's recipe for lamb with mash and salsa verde might well have costed down to £2 per portion but I suspect that capers, anchovies and fresh herbs are not store cupboard staples for the majority. And where can you buy just 2 shallots? MRJ's recipe for souffle was even more badly thought out than that... costing a pudding at £2 per head hardly makes it budget. And he used vanilla pod... pod! Yummy food for sure, but could have done better. I mean, if you can buy a frozen gateau for £2, why spend hours making a pudding for £8? Still love the show. And OH tickled me by saying, "I married Tom Kerridge. Only the smaller version." Yeah, never mind that he's also bald and a man. There's a compliment in there somewhere. Oh, and I got quoted in The Guardian last week announcing the BSFA Award nominations. Which was nice.